In this blog series, I would like to describe a few standalone enhancements in more detail, which can be very helpful in unique situations and can be used independently from the requirements to deploy process from Focused Build. In this six-part, I want to introduce you to a standalone enhancement which is named Cut-Over Checks & Activities. This extension is particularly useful for you when you have implemented or plan to implement Change Request Management with SAP Solution Manager. Cut-Over is an essential part of the transport process when you are working in a dual system landscape. This means you have two different development systems that both provide changes to the same production system. This is SAP’s recommended system landscape setup when you need to have a very innovative release cycle but still ensure maintainability for your current production system. But dual system landscapes comes with their own challenges as they increase the complexity for managing transports and for potential conflicts in such a landscape. One such challenge is at the time of the cut over, when all transports that have been developed in the project branch over several weeks or months are release to the maintenance branch. manually synchronize the other system in the landscape afterwards. Until now all these tasks didn’t had any tool support and had to be executed by the basis team executing the cut-over manually. The latest Focus Build Release SP02 provides a new CHARM extension that is called Cut-Over Checks and Activities. This is a new Assignment Block available for Cycle documents when you have installed the Focus Build component. 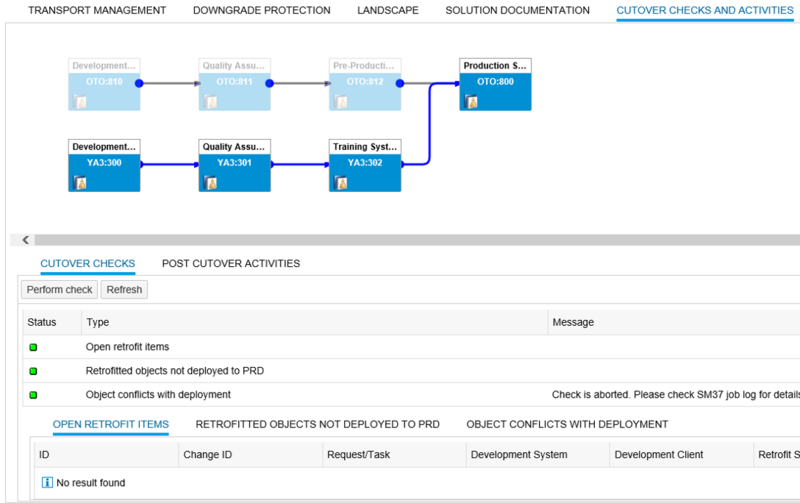 It will detect most common cut-over strategies automatically based on the landscape information the solution manager provides and shows a corresponding overview. validation that all retrofits are executed and in scope of the cut-over cycle to prevent any time of possible down grade based on parallel developments. The second part are the cut-over activities these provide you with the possibility to import the scope of the cycle in any of the the system from the target landscape. Nice blog…finally SAP has brought something in the application to help us during cutover activities. The White paper link is not available….please check? i’m not sure what White Paper you mean. The 2 links at the end (to Wiki and SAP Help) i just double checked and for me the do work. This is SAP’s recommended system landscape setup (White Paper Link) when you need to have a very innovative release cycle but still unsure maintainability for your current production system. I couldn’t find the link to the white paper ?